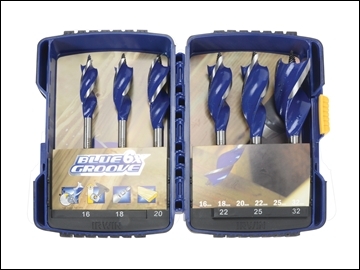 The Irwin Blue Groove 6x drill bits are ideal for drilling wood and offer 6x faster drilling penetration than a standard flat bit. Their 'Tri-Flute' design allows for faster chip ejection and their full screw tips ensure ease of use and pull through. The cutting spurs produce clean holes with minimal break out and the tampered flute reduces binding. The drill bits are also heat treated for extra durability. 6 piece set comprising 1 of each : 16, 18, 20, 22, 25 and 32 mm diameter.